Just eight points now cover the top three after leaders Preston Nomads and third-placed Roffey drew with each other, and second-placed East Grinstead also drew. Roffey recovered from 32-4 to post 214-8 after being invited to bat away to Nomads. Ben Manenti top-scored with 57, and Daniel Smith (41) and George Fleming (31 not out) also made important contributions. The ever-dangerous Carl Simon took 3-50 for Nomads. Nomads also got off to a bad start in reply, slumping to 39-4 and 61-5 before recovering to finish their 52 overs on 144-5 thanks to Stuart Faith (41 not out) and Kashif Ibrahim (44 not out). Fleming did the bulk of the early damage with 4-37. Grinstead missed the chance to go top after having to settle for a draw in a close-fought contest away to Billingshurst, who amassed 249-8 from their 58 overs after being asked to bat. Stuart Barber made 66 at the top of the order, number eight Andy Barr scored 50 exactly and Tom Nightingale hit 40. Bradley Hatchett was the pick of the Grinstead bowlers with 4-66. Grinstead ended their reply on 234-9. Dan Hopkins (47) and Will Adkin (65) gave them the perfect platform with a century opening stand, but 112-0 became 185-7 before Phil Norman made a key 37 not out. 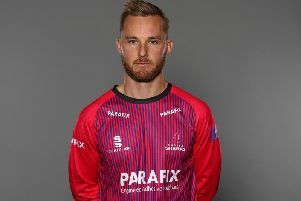 Dhanushka Mitipolaarachchi took 5-51 from 21 overs and Ben Williams bagged 3-109. Grinstead have played a match more than the other teams in the top three, but Nomads play their game in hand against the Sussex Development XI later today and will look to stretch their advantage. Elsewhere, Brighton & Hove and fourth-placed Bexhill contested a rare tied match in which both teams were all out for 104. Bexhill asked Brighton to bat first and bowled them out in 31.3 overs with no batsman making 20, although it could have been worse as Brighton were 26-5 at one stage. Dean Crawford and Shawn Johnson took three wickets each. Bexhill amazingly lost all of their first five wickets in reply with the score 18 and things looked bleak for them at 35-7, but valuable knocks from young Ethan Guest (25) and Jamie Wicks (26 not out) earned them a share of the spoils. Matt Wood again proved a real thorn in the side of Bexhill’s batsmen with 7-33 from 19.4 overs. Fifth-placed Horsham chalked up a comprehensive eight-wicket win at home to bottom club Eastbourne, who were skittled for just 77 after choosing to bat. Michael Munday took 4-8 from 6.3 overs and Kevin Stoute 3-16 from seven as Horsham ripped through. Horsham needed less than 14 overs to knock off the runs, Ben Shoare smashing an unbeaten 48 from only 31 balls. In the top flight’s other game, mid-table Cuckfield won by 100 runs away to second-bottom Middleton. Cuckfield remarkably rattled up 265-8 declared after choosing to bat despite being 8-5 at one stage. Marcus Campopiano (123) and Gregory Wisdom (60) masterminded the turnaround with a stunning sixth wicket partnership of 168, and Ben Candfield (34) and Nick Patterson (41 not out) continued the momentum. Jofra Archer did all the early damage with 5-15 from six overs. Middleton were all out for 165 in reply, with only Patrick Colvin (40) reaching 30. Josh Hayward was the most successful Cuckfield bowler with 4-52. Standings (played-points): 1 Preston Nomads 10-239, 2 East Grinstead 11-233, 3 Roffey 10-231, 4 Bexhill 10-198, 5 Horsham 11-197, 6 Cuckfield 11-180, 7 Brighton & Hove 11-175, 8 Billingshurst 10-155, 9 Middleton 10-136, 10 Eastbourne 11-129.